Flying doesn’t come cheap. Plane rides mean you have to have a lot of cash on hand, and in the bank. Flying could be a hassle. Flying is only for the rich and famous, and not for moms who should just be at home. You’ve probably heard all these things over the course of your life, and it might have incorporated the thoughts that flying is only for the elite, or that you’d be wasting so much money if you choose to travel by flying into your head. Just imagine not being able to get out of the country—or even out of your city or state—because of all these misconceptions. But the thing is that you don’t actually have to spend so much money on airfare. In fact, there are a few things that you could do to help you go to the destination of your choice without wasting too much money—and I’ll be telling you all about those things now! For starters, flying on Tuesday Evenings would help you save around 6% of cash that’s intended for airfare. This is because on Tuesday evenings, people are usually at home because they have to go to work the following day—meaning it’s not a peak time for flying, or traveling of any kind. However, according to travel site farecompare.com, airline companies still have to fill those seats up—so they just offer the seats for cheaper prices. And since not a lot of people fly on Tuesday evenings, travel web site Momondo, alongside the Department of Transportation, both agree that it would be a good time to fly. I’ve tried this and I must say, I enjoyed not being around a lot of people during the flight. I was going to London for the first time then, just to experience the whole double-decker bus, trip around the Buckingham thing (I didn’t see the Queen, but you know…) It gave me more time to relax and enjoy my journey, rather than just look forward to the destination. Not to mention, I got to use my money to get myself a really nice, comfortable room, and in buying souvenirs for my family and friends, such as one of those commemorative Wills and Kate plates. That wouldn’t have happened if I didn’t fly on a Tuesday Evening. More so, there are times when promos about discounted airfare and flight packages are posted online on Tuesday midnights—book your flights during that time and you’d be surprised at how much you’ll be able to save. Check individual analysis. You can’t always say, though, that Tuesdays are just the cheapest days of the week. There are times when promos set cheap flights to Wednesdays, or even Saturdays, because there are different routes to take, so you should do some research and check travel sites, such as GOOGL or Momondo. This is extremely helpful for those times when you want to go to a very specific destination—and have everything planned already. Book flights on Expedia. It’s great to book flights on online travel agencies, such as Expedia or Travelocity, because if you do that, you’d get discounts not only for the flight, but also for accommodations. This will be especially helpful if there’s a big event you’re attending because they can check for facts on the site. If I were you, I’d be preparing for next year’s Coachella, or Super Bowl, starting now. It’s never really too early, you know? Book around 49 to 53 days in advance. It’s simple. According to com, you’d be hitting the “cheap sweet flying spot” for around 7 weeks before your flight, which is roughly 49 to 53 days beforehand. I know there are those last minute plans, but if you really could plan ahead, why not do it, right? It would make you less anxious by a hundredfold! Choose your take-off time. Flying between 6 PM to Midnight are generally the most affordable times for flying, and would save you around 13% of expenses, according to However, you have to research really hard because some airline companies take advantage of this and charge a hefty price—and that’s what you have to avoid. Look for Layover Flights. I know it might be a hassle for some of you, but layover flights prove to be cheaper than non-stop flights. Just look at it as a way to visit more than one place, by just booking one flight. Of course, you won’t be walking around the layover stop for a long time, but you’ll still get to enjoy it, breathe the same air as the people around, and know you’ve gotten a slice of what it’s about—even for a few minutes or so. Follow those airlines’ social media accounts! You have no idea how signing up for a mailing list or following the tweets of your chosen airlines could give you a lot of discounts! Needless to say, if I didn’t know all these hacks, I probably wouldn’t know how to save $100 a year and more. I’m sure there are a lot more people out there who want to go to their dream destination, but have no idea how to save some cash on airfare. Aside from the tips you read above, what else can you add? Care to tell us about your own cheap flying hacks? Can’t wait to hear from you! Bill Achola is a financial publisher who owns a fast-growing, dynamic and innovative investment blog that empowers investors with high-quality and unique content. Check out his personal blog where he writes and talks about best investing strategies and actionable ways of making money @ http://traderushreview.us.com. 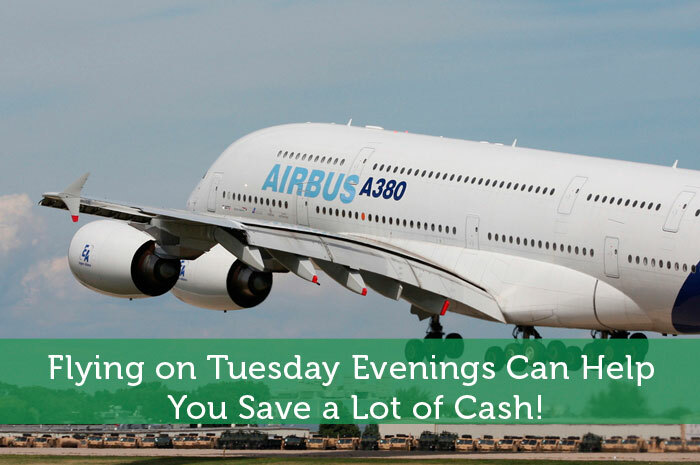 Flying on Tuesday Evenings Can Help You Save a Lot of Cash! I usually booked a few months in advance, for me it’s the best way to save money when buying plane tickets. I also signed up on some airlines to let me inform if they have an ongoing promos. Signing up with airlines with on going promos is SURELY a great deal. This is a great trick. Now, the next time I fly out of the country, I’ll assure that it is on Tuesday night. Saving approximately 6% is not that bad. I’d heard this statistic somewhere before but brushed it aside. Thanks for affirming this tactic. I’ve had an intense hankering to travel. Think I’ll try to book for a Tuesday (in 7 weeks, of course)!